By buying this product you can collect up to 1399 loyalty points. Your cart will total 1399 points that can be converted into a voucher of Rs 279.80. World's First Robotic Body Massager gently massages and caresses as it rolls over your body and relaxes your tired muscles. 3 settings for vibration massage, gentle pressure massage or light tickling massage . Specially designed addition to the wheels, these patented fingerettes are made of nylon to gently stroke and massage when moving on your body. A comfortable speed at which the Milagrow WheeMe moves over your bosy. The kind of battery used. The technology that helps the Milagrow WheeMe move around your body without falling. The small size and light weight of the Milagrow WheeMe helps you carry it everywhere. Just tuck it into the side of your suitcase! ›› Why is WheeMe so amazing? The state-of-the-art WheeMe is the first commercial robot of its kind, capable of navigating gently and safely on a human body without falling off in most cases. The high performance WheeMe is based on low-cost manufacturing processes and is affordable for all. ›› What age is WheeMe suitable for? WheeMe is designed for adults, teens and children. WheeMe is perfectly safe and its light weight cannot pressure sensitive body parts. Since minimal operation is required, it is not intended for children under 5 years old. ›› What can I do with WheeMe? WheeMe works best on your body's large horizontal areas.Lie down and put WheeMe on your back or stomach.When activated, WheeMe will gently caress your body, creating a nice gentle feeling. ›› Can I play with WheeMe immediately after purchase? Yes. All you need are three AA batteries and you are ready to get started. ›› Does WheeMe have a remote control? No,WheeMe works completely autonomously.WheeMe's sensors randomly steer it across your body,without you or anybody else controlling it. ›› What cant WheeMe do? WheeMe can't give you a deep tissue massage since it's very light. Nor can it prepare your supper, cook or swim.However,as the first massage robot in the world,it will generate a tremendous feeling that you probably probably won't find anywhere else. ›› How do I take care of my WheeMe? Actually there's very little to do. Of course you should read all cautionary statements in the user guide,including all electrical warnings and handling instructions. To clean WheeMe, use only a damp cloth without soap or any other cleaning soaps or spray. Please do not attempt to make any mechenical repairs yourself as this will automatically void the warranty. WheeMe's special sensors detect its boundaries for steering safely on your body without falling off in most cases.The result is that WheeMe moves effortlessly and pleasurably across your body on wheels fabricated from a safe, silicon-based rubber. Tough day? Lie down and place WheeMe on your back or stomach for unassisted stress relief and relaxation. With its unique tilt sensor technology, WheeMe slowly rolls along without falling off or losing its grip, gently stroking and caressing with its nylon fingerettes. Simply choose from 3 settings, for anything from soothing vibration to a delightful light tickle. Then let WheeMe do the pampering while you relax or watch TV! Attachable "fingertte tip" gently spins and skims over tired muscles and improves blood circulation as well even as it stimulates the nerves. Works best on your body's large horizontal areas i.e. lie down and put it on your back or stomach. Very Effective for lower back pains. Works completely autonomously and wheels stop if you pick it up and turn it over. 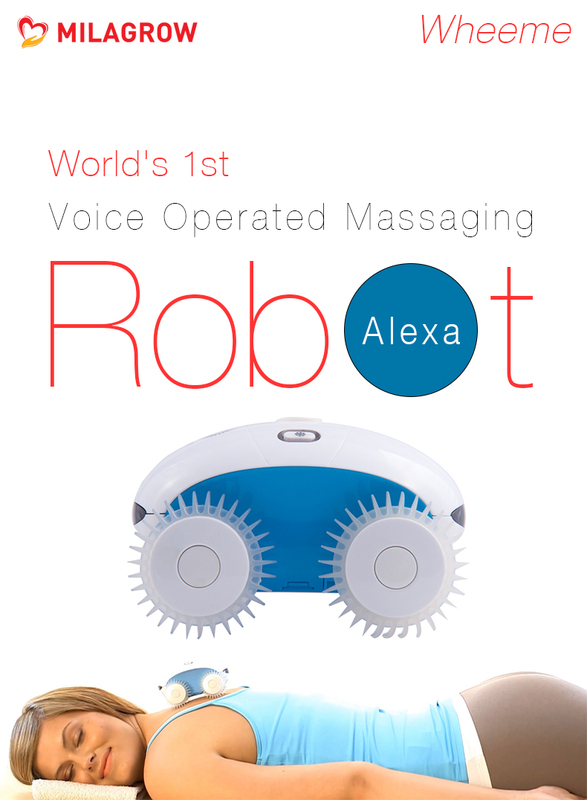 World's First Robotic Body Massager gently massages and caresses as it rolls over your body and relaxes your tired muscles. Milagrow Body Robot has 3 settings for vibration massage, gentle pressure massage or light tickling massage . Mialgrow Wheeme navigates gently and safely on a human body without falling off if the angle is less than 45 degrees. Milagrow BodyBot is very Effective for lower back pains. Tough day? Lie down and place WheeMe on your back or stomach for unassisted stress relief and relaxation. With its unique tilt sensor technology, Milagrow WheeMe slowly rolls along without falling off or losing its grip, gently stroking and caressing with its nylon fingerettes. Simply choose from 3 settings, for anything from soothing vibration to a delightful light tickle. Then let WheeMe do the pampering while you relax or watch TV! Attachable "fingertte tip" gently spins and skims over tired muscles and improves blood circulation as well even as it stimulates the nerves. Works best on your body's large horizontal areas i.e. lie down and put it on your back or stomach. Works completely autonomously and wheels stop if you pick it up and turn it over. Easy to use and maintain Can be used by all age groups except kids below of age five. A massage can benefit a person in many ways. Enhancing the function of a certain body part, promoting muscular relaxation, aiding in the process of healing are some of the benefits of a massage. Nothing can invigorate you more than a soothing massage after a tiring day. You never get full satisfaction with an electric, manual or personal massage. A person can become their own massage therapist with the Mialgrow Wheeme and soothe the aching muscles of their back without anyone's help. Be it a full body massager, a hand-held one or a even a therapeutic massager, no one can match the effectiveness of the Milagrow body massaging robot, if used continuously. Make the right buying decision. Milagrow Wheeme comes with 1 year comprehensive warranty or guarantee. Browse through the models featured on our site with expert descriptions, detailed specifications, videos, perfect product comparisons, price comparisons to help you arrive at the right buying decision. Milagrow also offers free home delivery for most of its products along with easy EMI options, COD, payment by cheque. Get the best prices and the best online shopping experience every time, guaranteed. Milagrow Humantech is the best place to buy a robot massager . Just place your order today and forget the hassles of bringing it home. We will ship it to your address absolutely free in two business days. So, order today and let back aches be history.